To pay tribute to the All-American hot dog, The Hot Dog Man is traveling to a different Hot Dog Joint each day during the month of July, National Hot Dog Month. Lucky for him, July is one of those great months with 31 days and that means 31 hot dog stops. I thought I had a great job!!! 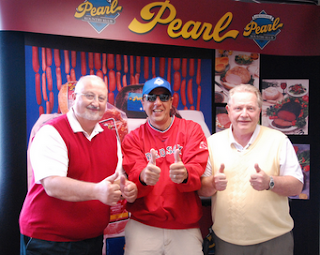 That's the Hot Dog Man in the center of the photo along with the owners of the greatest hot dog maker on the planet, Pearl the official hot dog of Yank's Franks. I hope everyone that reads my blog will stop by Yank's Franks on Tuesday, July 10th and be a part of Hot Dog History. I can't wait for the movie. Frankly, We Are Honored To Be A Part Of The Hot Dog Tour! Last year Yank's Franks was voted 2nd in the NECN Baby You're The Best Hot Dog in New England. Well it's voting time again and we need your help. Please follow this LINK and vote for Yank's Franks. Voting ends this Wednesday evening, June 27th at 8 pm. We would really love to have the bragging rights to 1st place so please tell your friends and family. It seems that only one vote can be recorded from each computer so don't sit around clicking away. Remember, voting ends in 2 days so send out the call that Yank's Franks wants your vote for Best New England Hot Dog! Thank you and keep your fingers crossed. The Yank's Franks River Dog's 1st place season wrapped up this evening with a celebration party at Yank's Franks. The River Dogs were the youngest team in the Wells-Ogunquit Little League and obviously the most talented. Each member of the 2012 championship team received trophies as well as awesome hot dogs and fries (nothing goes better with baseball than hot dogs). Great job Coach Soper and congratulations to all the ball players. Get em again next year.